The sale of Robert and Donna Jackson’s extensive William Burroughs collection to the New York Public Library made national headlines. The Edwin Blair Beat Literature Sale at Pacific Book Auction features some incredible items, including William Burroughs manuscript material. 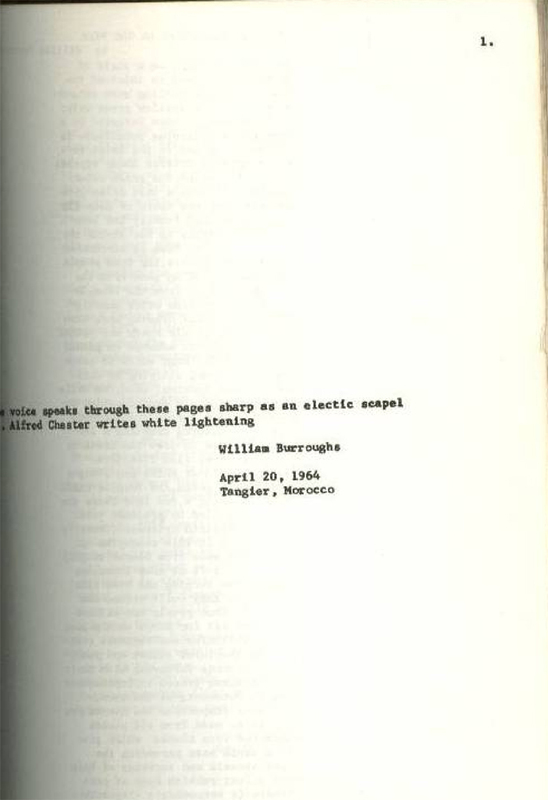 A recent catalog from Beat Books in London offered two Burroughs manuscripts for sale. Burroughs manuscript material is hot. In fact, it always has been. The question is: Have recent events taken the pursuit of Burroughs manuscripts to new, maybe even ludicrous heights. 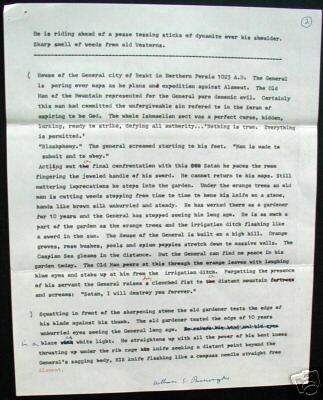 I site the example of a typed one-line Burroughs manuscript recently sold on Ebay. (Here’s a pdf in case the auction listing expires.) The line reads “One voice speaks through these pages sharp as an electric scapel Mr. Alfred Chester writes lightening,” signed by Burroughs dated April 20, 1964, Tangier, Morocco. There is a considerable history to this small item. The page comes from the papers of Allen DeLoach, editor of Intrepid. 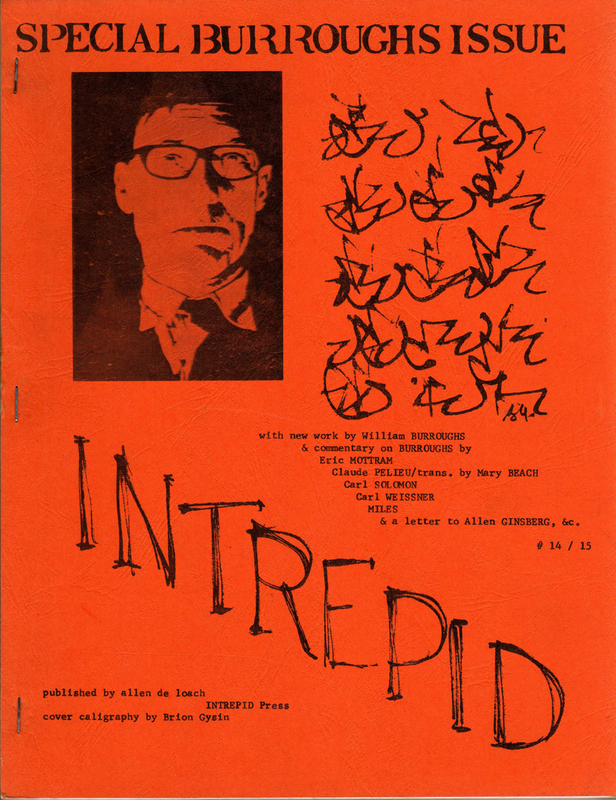 In 1969, Intrepid 14/15 devoted an entire issue to Burroughs. 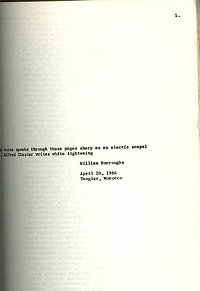 The issue is a landmark in serious scholarly treatment of Burroughs as an author. 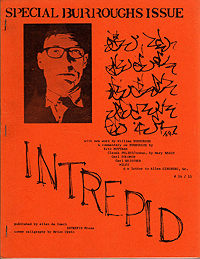 The entire run of Intrepid is a major example of the mimeo revolution and an important document of the counterculture and post World War II letters. The line references Alfred Chester, an expatriate writer in Tangier and a figure of note in his own right. I believe the line is an original creation and not a quote from a previous work. The signature is early and from Tangier and that creates more interest. The manuscript has impeccable provenance and is in fine condition. Based on how this item performed, there will be more manuscript material available from the Intrepid files in the near future. This item is very interesting. The public interest in this auction gets to the heart of who, what and why of collecting, Burroughs or any author. What qualifies as a manuscript? Signature versus inscription? Is this manuscript worth more than a lengthy, substantial inscription on a published work? What is the value of a Burroughs signature: early, middle and late career? I will not touch on them all, but the biggest question was: Is it worth over $500? My gut reaction is that $530 is crazy. But a look at the market makes me not so sure. I compare it to the multitude of Bukowski manuscripts that flood the market. Like the Intrepid manuscript, these Bukowski examples are typed, sometimes Xeroxed, poems with no trace of the author’s hand but the signature. Poems of length commonly fetch hundreds of dollars. Drawings, corrections, or inscriptions depending on detail can push the price to $700-1000, even more for truly spectacular examples. The manuscript in question differs from these Bukowski poems by its brevity. 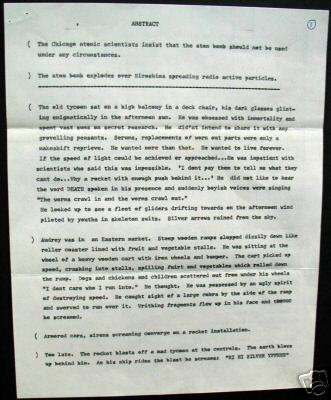 Clearly, the one line Burroughs item is not spectacular, but Burroughs manuscript material is far more unusual than Bukowski’s. 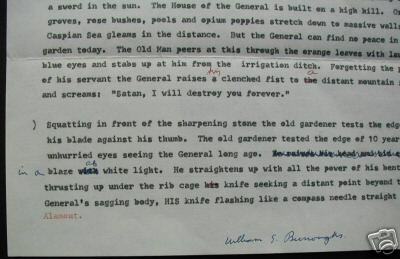 Burroughs manuscripts, particularly from the 1950s and 1960s, are largely accounted for and rarely hit the open market. In addition as the many versions of Naked Lunch and Soft Machine prove, Burroughs never really finished a work. They were always open for revision. In many cases, these revisions are major changes in Burroughs’s line of thought. See the publication history of Soft Machine. Clearly, the items in the Jackson collection are important and valuable for scholarly reasons. The items for sale in the Edwin Blair sale and at Beat Books are far beyond the one line manuscript on Ebay. They are substantial pieces that in some cases possess holograph corrections or in the case of the Naked Lunch manuscript at Beat Books possesses an outstanding literary history and significance. These items command thousands of dollars. An interesting comparison is Burroughs inscriptions on published works. At the Nelson Lyon Sale in 1999, I bought Floating Bear #9 featuring “Roosevelt After Inauguration” signed by both Burroughs and Ginsberg on the front wrapper. On the front wrapper, Burroughs has also written “All the better for a soujourn in Hell. All hope at least pretend to give up waiting your chance,” and additionally signed by Burroughs under his printed name after “Roosevelt.” It is Los Angeles poet John Thomas’s copy. The item is considerably damaged but the history of the document, signatures and inscription is fantastic. The ties to the mimeo and alternative press scene are similar to the Intrepid piece. I purchased it for roughly $100. Granted that was years ago, but it would be interesting to see what the item is worth today. Other ephemera, like postcards or short business letters do not seem to reach the heights of this manuscript. Personally, I appreciate writing in Burroughs’ hand even on a small level, like a correction or inscription, to larger typed material capped with a signature. In any case, it appears that Burroughs manuscript material in any form is a sure bet on the market. Seemingly, the boundaries of literary and scholarly significance are much broader in dealing with Burroughs in the arena of manuscript material. For me, I will drool over the items in the Robert Jackson collection, Edwin Blair sale, and Beat Books catalog. I will pass on the current item on Ebay, and will look with interest at the other larger offerings from the Intrepid files. Burroughs manuscripts are truly rarified air in Burroughs collecting, maybe even more so than other authors. With much of the work of gathering his manuscripts done, I choose to focus on book and magazine appearances that have passed through his hands marked by a signature or inscription. They are more interesting and valuable to me. It is such personal choice and touches that make any collection special to the individual collector and to the larger community. P.S. 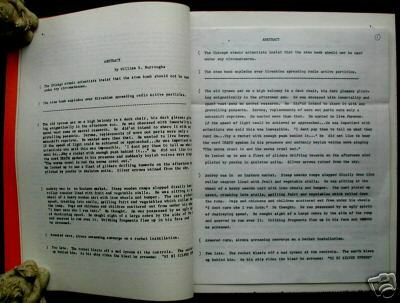 RealityStudio notes: Now there is a 2nd Intrepid manuscript on ebay. (Here’s a pdf in case the listing expires.) The listing shows five pictures of the manuscript: 1, 2, 3, 4, 5. I have a what seems to be first draft manuscript of Western Lands, also Joe the Dead and Western Lands (?). I am unfamiliar with this work, can somebody help me gauge it’s import, value, details I need to keep an eye out for? Thanx. Interested in selling, Broadside of poem by Burroughs,”Remembering Jack Kerouac” with photo of Burroughs taken by Ginsburg. Broadside is signed by Burroughs. Good Condition. White Fields Press. Published in Heaven Poster Series. Please help me if possible. Thank You.